Pearlsong Press - Love is the Thread by Leslie Moïse, Ph.D. Sustained by the metaphor of knitting, the memoir Love is the Thread traces the way one spiritual friendship can change all our relationships, with strangers and friends, from friends to family, and beyond. Love is the Thread centers on the friendship between two women, one snared in a life-long struggle with bipolar disorder, the other reweaving her life after an abusive relationship. Spirituality, encounters with nature, and vacations on the Delaware shore form the threads of a friendship as varied and closely knit as the stitches in a handmade sweater. From the discovery of hidden colors in fresh snow to the satisfaction of teaching a young nephew to knit, Love is the Thread savors life's small glories, ultimate challenges, and all the moments of humor and tenderness in between. Leslie Moïse is also author of the award-winning novel Judith. 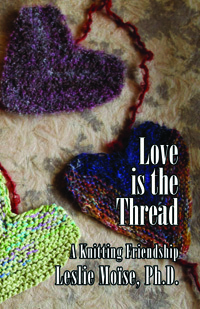 "Love is the Thread is a heartfelt exploration of both the power of knitting and the power of friendship to bring together new stitches throughout a life. If you enjoy examining the connections between what our hands do and how our minds work, you"ll love this book." beautifully written, chock full of wisdom and humor, and a nakedly honest and human memoir. It's a GREAT read!" "There are books that bring enjoyment and ones, like this one, that are a profound experience. I stayed up way past my bedtime to devour this book, then time with a tissue box dabbing tears of love in reflection of those who have shared my own journey mixed with moments of excitement thinking of friends who would love this book. Well, get your own copy girlfriend! My copy will forever be on my nightstand to pick up for a quick chapter, a pearl of wisdom or the beautiful description of spring on a cold February night. Definitely a winner for a book club!!! The many sweet layers of this book beg for discussion.Love is the Thread will weave magic in your soul."